World ASL Series of Poker | Proudly Owned and Operated by the Deaf Team! 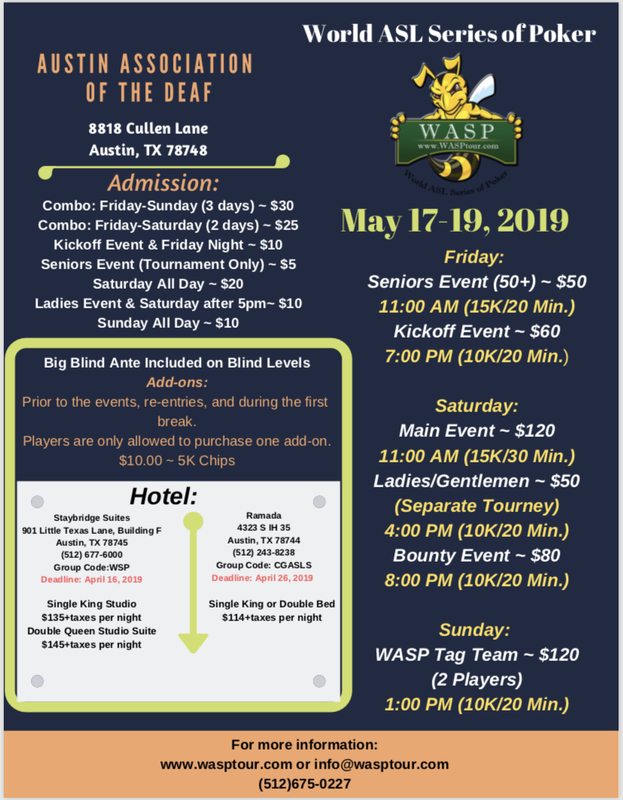 Any questions or information requests on poker rules, payout structure, and such, please contact us at info@wasptour.com. 10/16/2017:- - October 6-7, 2017: Cleveland Association of the Deaf, Cleveland, OH is available results! 10/14/2017:- - October 13-14, 2017: Dallas Association of the Deaf, Dallas, TX is available results! 9/12/2017:- September 8-9, 2017: Holyoke Athletic & Social for the Deaf, Holyoke, MA is now available results! 3/7/2017: WASP Tour #15: Greyhound Dog Track & Poker Room is now available! 8/30/2015: WASP are accepting new leagues to be part of our website to provide one place stop for everyone. Contact us at info@wasptour.com if interested. 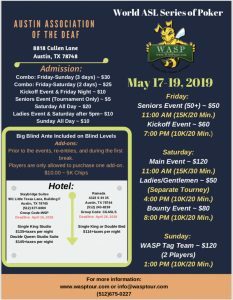 © 2019 World ASL Series of Poker | Proudly Owned and Operated by the Deaf Team!